Why am I seeing a survey? We are trialling Google Consumer Surveys on Luton Today. We are always looking at different ways to help fund our commitment to quality local news. These surveys generate revenue for us, which in turn helps fund our local editorial team and keep our online content free of charge. How often will I see a survey? If you complete a survey you will not see another one for 30 days, though if you don’t complete or skip you may see it again on your next visit. I’ve answered a survey but seen another within the last 30 days, why? Can I skip a survey? Why can’t I skip the survey on a Mobile device? 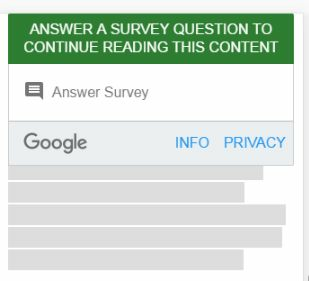 You will need to click on ‘Answer Survey’ as shown in the screenshot below; this will then give you the option to skip the survey.